Ireland’s definitive Blues Big Band “The Catfish Blues Orchestra”. 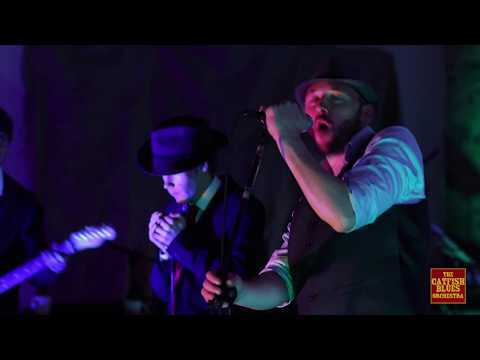 Comprised of some of the finest blues talents based in Ireland today “The Catfish Blues Orchestra” is a truly unique musical experience. The band consists of two guitars, bass, drums, vocals and harmonica as well as a brass section. Altogether this 8 piece band produces a truly powerful sound that has to be experienced live to be fully appreciated. Driven by a love for authentic blues music the group draw on influences ranging from the early blues masters of the delta such as Robert Johnson & Sonny Boy Williamson, to the electric Chicago and Texas blues masters such as Muddy Waters and Freddie King, up to British blues invasion guitar gods such as Eric Clapton, Peter Green all the way up to contemporary influences such as Robben Ford and Derek Trucks. The Orchestra draw on all of these influences including many others to create there on rich and soulful blend of Rhythm and Blues.